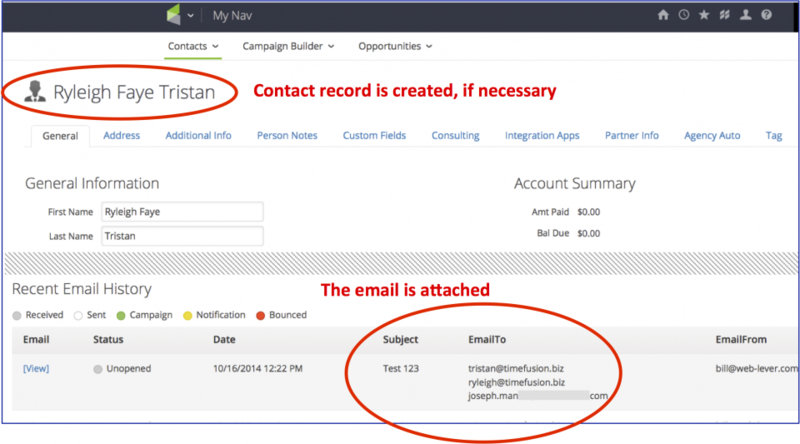 If you’ve used Salesforce then you learned how important this capability can be – now with emailAttacher Infusionsoft works the same way! emailAttacher works with ALL email services and clients. Just continue using your current Gmail, Outlook, Mac Mail, Hotmail, Yahoo! mail, or any other service. When you sign up for emailAttacher you are issued a special Attacher address unique to you. 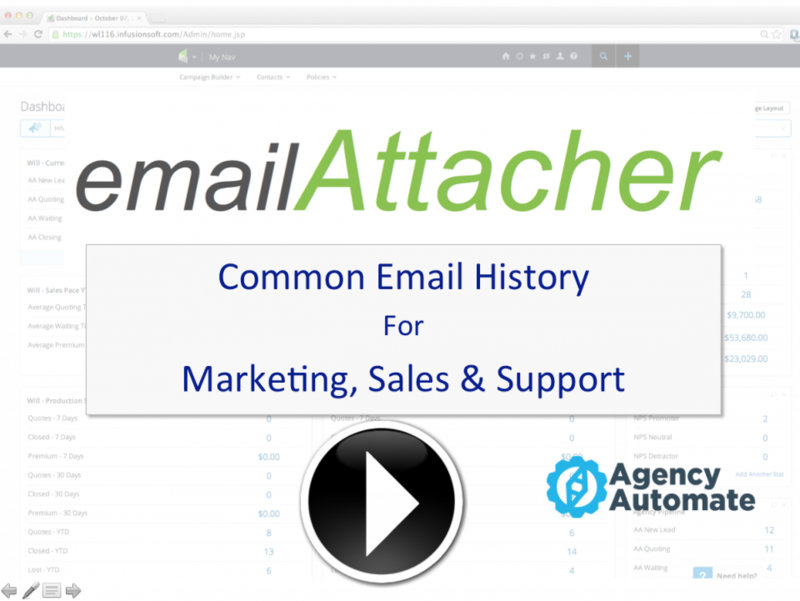 Method 2 – Direct Attach: send an email directly to emailAttacher with your Attacher address on the TO: line and add the email address of the contact at the end of the Subject: line. This email is delivered only to emailAttacher and not to the contact. The emailAttacher app receives a copy of your email and locates your Infusionsoft contact record for each person in the TO: line of the email message. Or if you sent the email directly to emailAttacher it locates the contact record for each email address found on the Subject: line. If a contact record does not exist then emailAttacher creates it and notifies you. emailAttacher then attaches the email to the contact record for every recipient on the TO: line if you used BCC Attach, or on the Subject: line if you used Direct Attach. Note that any files attached to the email message are not processed and will not be attached to the contact record. 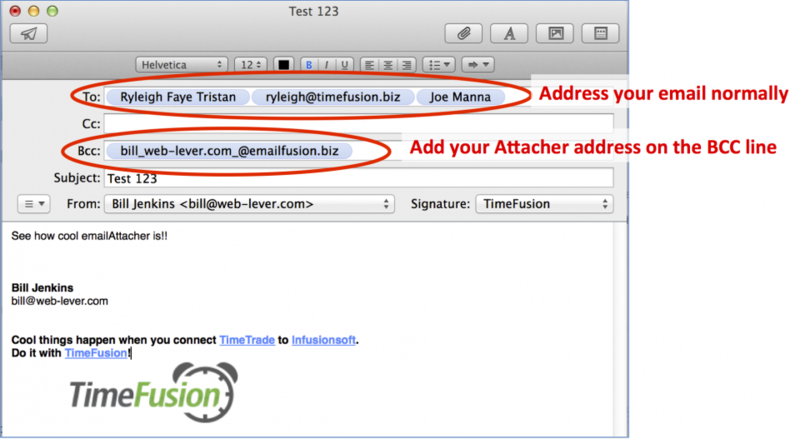 emailAttacher only takes action on an email if the FROM: address is a sender you’ve authorized. So if someone else tries to use your Attacher address they will not succeed and their email will not be attached. Your email is never stored on the emailAttacher server. It is received, processed and deleted within seconds after it arrives. Note, emailAttacher is not for use with any system that sends emails automatically. Only manually initiated emails may be sent to emailAttacher. If you’re upgrading from the Free Version to the Full Version, just be sure to use the same email address on the order form as the one your current account was created with.